Seven candidates are vying for three open Cupertino City Council seats in the upcoming November 6 election. The deadline to file was Friday, August 10. Councilman Barry Chang’s seat is open as he will term out of office after serving two terms. The other two open seats are currently held by Darcy Paul and Savita Vaidhyanathan, who are both seeking another four-year term. On Monday, Sept. 24, the League of Women Voters will hold a candidate forum at 7 p.m., Cupertino Community Hall, 10350 Torre Ave.
Campaign statement: On Council and as Mayor of Cupertino, I have worked hard to represent our community values so that we can continue to have honest, open, and effective conversations rather than a government that serves as a rubber stamp for self-entitled special interests. There are many external pressures facing our community. We need elected leadership that understands the motivations, and has the will to act upon rational, transparent, and coherent principles to deliver a conversation that supports disclosure rather than concealment. I will continue the work I’ve done in support of ensuring the sustained success of our community. After bringing our Volunteer Fair back to Cupertino, I am re-affirming a commitment to making sure that we spend our time engaging in activities of our choosing and that we have opportunities to share these experiences and real benefits with others. I will continue to work hard, listen to residents, and apply intelligence and experience, rather than glibness and empty acronyms, towards difficult problems. The former approach sometimes seem contentious, but it avoids the inevitable and exacerbated problems of the latter. Campaign statement: I’m honored to serve Cupertino on the City Council since 2014. I ask for your vote again to continue solving the challenges we face in Transportation, Housing, Environment and Senior living. You can count on me to work on these priorities. On transportation, I represent five West Valley Cities on Valley Transportation Authority (VTA) Board. As your elected representative I drove initiatives to cut traffic congestion, reduce pollution and support our Youth and Seniors. During my year as Mayor, I spearheaded POGO carpool app for students and RYDE curb-to-curb transportation for Seniors. The city received state-wide awards for reducing carbon emissions. I led approval for more senior affordable housing. Earlier, I helped negotiate $350M from Measure B for transportation solutions in Cupertino and Highway 85. I regularly encourage youth civic programs like “Girls in Government”. The challenges we face require regional solutions in collaboration with our neighboring cities and county agencies. As Councilmember and Mayor, I’ve proven my ability to build consensus, and dialogue with Apple and San Jose to meaningfully mitigate traffic. That’s why I’m endorsed by elected leaders in Cupertino and neighboring cities supporting my approach to real achievable solutions. Candidate information such as photos, biographies, statements, and links to forums will soon be available at www.cupertino.org/election. Campaign statement: I’m fighting for a community-oriented Cupertino, where generations of families from a variety of backgrounds can thrive. Silicon Valley is growing rapidly, unequally and unsustainably. This election, we have the opportunity to elect a new Council that will fight for balanced development that meets the needs of our community and reflects the values and vision of our residents, not special interests. Together we can take bold action to reduce traffic, create affordable housing opportunities, build our resilience to climate change, counter school overcrowding or under-enrollment, and enhance transparency in government. I know what makes us special because I’m a product of Cupertino; I was raised here and educated at our public schools. I’m an experienced City Government public policy professional who passed City laws and successfully navigated City bureaucracies. I understand City Planning, the major challenges we face from State law impacting our cities, and what we can do to protect against unintended consequences. I have also worked as a Community Organizer in Cupertino, mobilizing people to improve our city. I taught Music in Cupertino for years and have served on multiple non-profit boards. I ask for your vote so together we can secure Cupertino’s future. Campaign statement: Cupertino is threatened by traffic gridlock, crowded schools, housing affordability crisis, and environmental degradation. The root cause is city government enabling overwhelming development. I’m a champion for Democracy and Sensible Growth, keys to maintaining our quality of life. Using my professional skills, I have presented dozens of data driven analyses on development to the city that demonstrated failings in proposed mega developments. I’m a leader in the Better Cupertino grassroots organization of neighbors. Sensible Growth is crucial and balances the many aspects of our community. We should not let developers’ interests dictate to us. The incumbents seeking reelection continue advocating for massive density projects. And several other candidates have been and are vocal supporters of massive overdevelopment at Vallco, now 22 story buildings. I’m a 21-year Rancho Rinconada neighborhood resident. My wife and I are a middleclass family that works hard so our children can attend CUSD schools. My father and grandfather were veterans that taught me very strong ethics, the importance of Democracy, and to always do the right thing. Every vote I will cast will be for the majority. I want to hear from you. On the Council I’ll serve you. Sincerely, Jon Robert Willey. www.Jon4Democracy.com. Campaign statement: Hung Wei has lived in Cupertino since 1990. She is an advocate for public education. In 2007, Hung served on the Governing Board of Fremont Union High School District, serving 10,000+ students from Cupertino, Fremont, Homestead, Lynbrook, and Monta Vista High Schools. Her model is “Servant Leadership” – serve with compassion, communication and collaboration; lead with transparency, fiscal health, and heart for teens. During her tenure, Fremont Union High School District has strived to educate the “whole” child – fostering high standards in academic successes, while cultivating pathways in performing arts, sports, STEM, business and entrepreneurial skills. Hung’s volunteer work doesn’t stop at the school level. She volunteers at nonprofits including the High Schools Foundation, the Northwest YMCA, Asian American Parent Association, the Rotary Club of Cupertino, and EMQ Auxiliary supporting Uplift Family Services. With 11 years of school board service and 20+ years of community volunteering, Hung has developed deep dedication and love for Cupertino, a hometown to her! Vote Hung Wei for Heart for Cupertino – Hung will dedicate her time, energy, and passion in bringing collaborative spirits to Cupertino City governance, to build teamwork, unity, and solutions, in moving Cupertino forward with innovative and positive future vision. Campaign statement: Residents value Cupertino’s character and diversity, but unbalanced growth impacts our quality of life. Loss of retail forces us to shop out-of-town. Poor planning burdens public safety, schools, parks, and infrastructure. Environmental and traffic problems affect our health. As a CUSD Trustee, I brought positive changes to critical problems, including restoring trust and replacing a superintendent. Now I hope to address vital Cupertino issues. Council will face important development decisions at Vallco & The Oaks, Lehigh issues and more. The State Legislature is pushing laws to allow developers to bypass local control and environmental review. More than ever we need our Council to advocate for residents who value jobs-housing balance, quality schools, better environment and less traffic. I will fight for Cupertino, working with residents to adopt sound policies. My family has lived in Cupertino for 20 years, where our children attend public schools. I became involved in city and school issues because decisions often conflict with residents’ inputs and best interest. I’m committed to transparency, evidence-based decision-making and fiscal responsibility for equitable solutions that respect residents and local businesses. Campaign statement: I am running for Cupertino City Council again to help create a Council that will collaboratively work together to achieve progress on Cupertino’s key issues: 1)Skyrocketing housing prices driving teachers, public safety workers, and other key residents to leave Cupertino; 2)Traffic, including short-term relief and future technologies and driving patterns providing long-term solutions; 3)Economic sustainability, so that our major employers and small businesses continue to provide the revenue that supports our City. While on the City Council before, working with my fellow Councilmembers, we added significant improvements to the City including key trail and recreational facilities, such as the Mary Avenue Bicycle-Pedestrian Bridge and the Blackberry Farm and Stevens Creek Trail renovation. Many shopping centers were modernized and a thriving community gathering place was established with the Main Street project. Finally, when I was Mayor, Apple Park was approved, providing for Cupertino’s long term economic security with direct and indirect fiscal benefits. Apple recently announced that they will work with the City to develop meaningful traffic solutions. I will work together with my fellow Councilmembers and our residents to move Cupertino forward and create a better place for all of us to live, work, and play. Please re-elect Orrin Mahoney to the Cupertino City Council. www.mahoney4council.com. 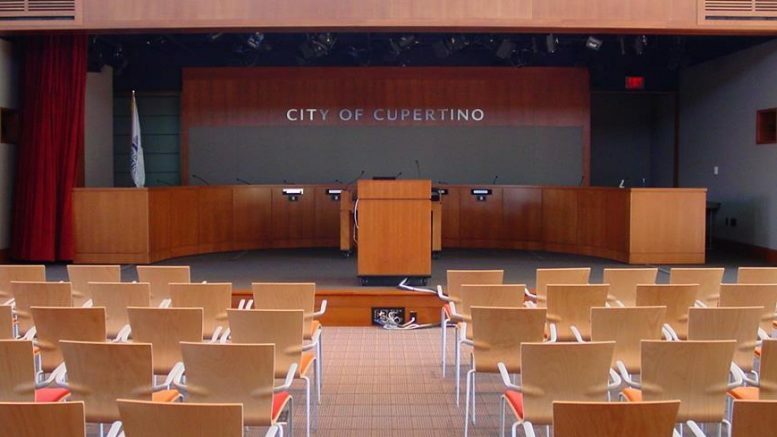 Be the first to comment on "Seven vying for three open Cupertino council seats"